Susan Russell was the Executive Director at Chicago Animal Care and Control until she was released from her position by Chicago Mayor Rahm Emanuel on June 30th. It’s a story that’s not going away and Rover-Time wanted to share its humble (and overdue) position on it all. This post is for Chicago’s rescue community and its adopters and fosters, some of which became our valued customers, that have helped to save and protect healthy and treatable animals across our city. We’ve seen and felt the improvements CACC has made over the years. For a comprehensive list of all the ways Susan Russell has brought change, read here. And since her sudden departure from the municipal open-admission control and sheltering facility, we have followed Susan’s writing on her blog. On it, she tries to compile her experiences and observations over the past few years volunteering with open admission animal shelters and especially the last two years as the director of the City’s animal control and sheltering facility. One of our favorite and longer posts, titled “If We Plan It, It Will Come — Creating A No Kill Chicago,” outlines the fundamental steps it would take to get there. It’s a must-read that shares a fantastic list of pet resources towards the end of it. At Rover-Time, we have personally witnessed the transformation of an adopted pet finding its home, its place, and purpose. We have been honored to serve hundreds of pet-loving families that supported their local animal rescue. Connective conversations with these families have helped us become a trusted referral source that advocates on behalf of all pets while attempting to bridge gaps in our community and larger city. After all, dog walking isn’t just about taking care of the dogs, it’s about their pet parents, too! So it’s with excitement that I’m sharing our decision to join the Small Business Capital Campaign Committee at One Tail at a Time. We want to help open their ISO Center by 2019. Why? 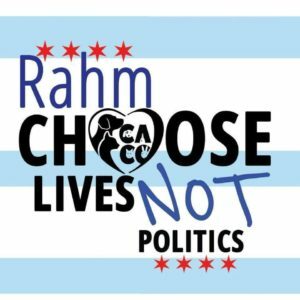 Because Rover-Time agrees with Susan Russell and we want to hold up key stakeholders, like One Tail at a Time, in their efforts to bring Chicago one step closer to creating a No Kill Chicago. ISO is short for Isolation. The Center will be used to house dogs that come from local shelters (Chicago Animal Care & Control and Animal Welfare League Wabash) that have endemic contagious shelter diseases requiring animals to be quarantined once rescued. The property is centrally located in Chicago’s Logan Square neighborhood at 3567 W Dickens and was purchased by One Tail at a Time with a re-zoning contingency. Their hearing is scheduled for late August, during which they expect to be approved to run an animal care facility. 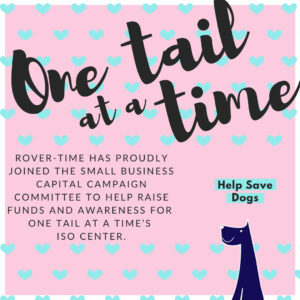 The organization has a goal to raise $350,000 and Rover-Time would like to raise at least $2,500 for One Tail at a Time to sponsor one single kennel in the property. The rest of the money raised by Major Gifts, Corporate Donations, OTAT Family, and fellow Small Businesses will be spent on gutting and rehabbing the facility. An HVAC system will need to be added, there’s asbestos to remove, foundation work is necessary, 15 kennels will be added, and plumbing, electric, masonry improvements will need to be completed before OTAT can move in. Visit our fundraising page here to read more and to learn more about the perks we’re providing to our generous donors. Giving today will truly do good for others. Any amount makes a difference and will be life-saving. Julia Rohan founded Rover-Time in January of 2012 and received her formal training at FetchFind Academy, a program for aspiring dog trainers, based in Chicago. Julia lives in Irving Park with her husband Mark. Together they co-parent Archer, their 3-year old son, and Chauncey Billups Vanderhoff, an over-confident, territorial, and anxious 8lb. Chihuahua-Terrier mix. Both boys melt her heart hourly.